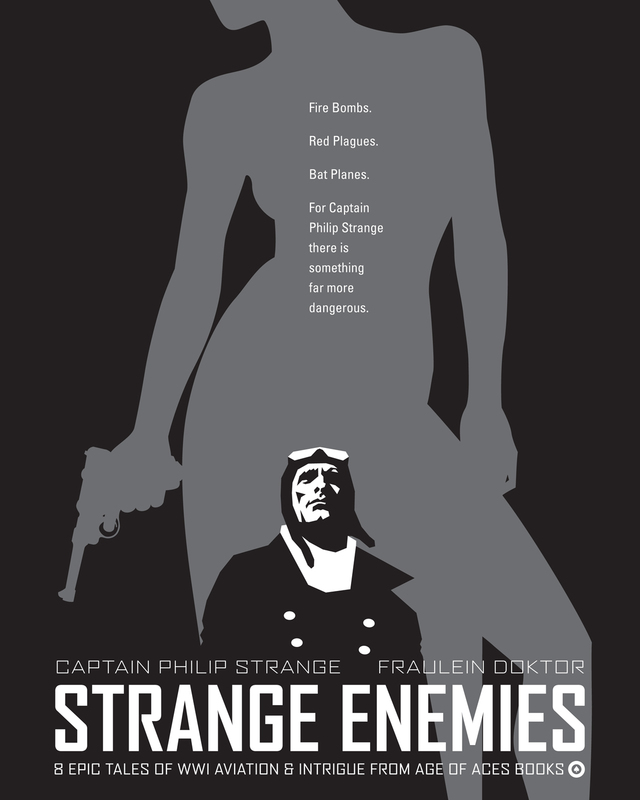 The Strange Enemy of our new book Captain Philip Strange: Strange Enemies, Fraulein Doktor, pops up in the oddest places. 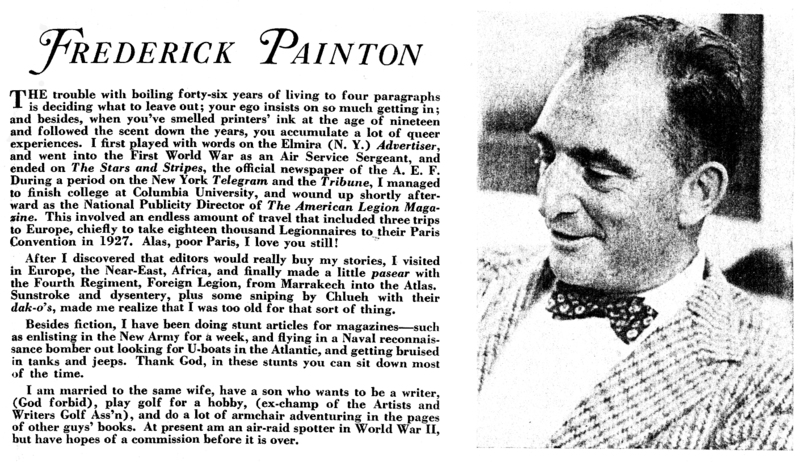 Here she is causing trouble in Frederick C Painton’s “Soft Thunder” a year and a half before her first appearance in Donald Keyhoe’s Philip Strange stories. Unfortunately he died of a heart attack on a Guam airfield while covering the Pacific war. He was just a kid who played Tennis to those two hard-boiled soldiers—but there was stuff in his make-up that kept him battling in the flaming skies. It was a grim game they played—they stuck to the rules and played like sports, but they knew that the loser would find flying death. And then into their game kited a kid who seemed soft—but there is lightning with even soft thunder. We have more of Chris Kalb’s great splash page designs for the second volume of our Captain Philip Strange series. It was hard to pare it down to only three, so we’re throwing in a bonus wallpaper and making it four! So we have the cross-shapped daggers raining down from Devil’s Bait; Strange vs the giant black Zeppelin of Raid of The Red Reaper; the flame belching U-boat of Dromes of Hades; and the the Bat Staffel itself from Drome of the Bat Staffel! Of course you can check out all of Chris’ designs from Strange Enemies on the Strange Enemies Design page! They are available in our Age of Aces Desktops Gallery in a variety of aspect ratios—pick the one that best suits your computer! Strange did not hear the rest. He was back in the year before the war—a frightened youngster, pursued from Berlin by a money-grubbing uncle. 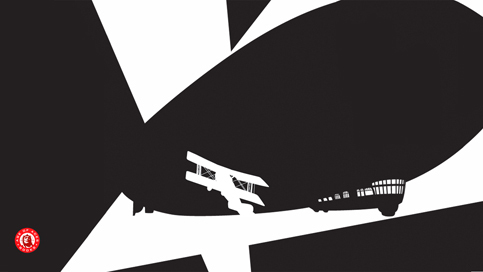 A scene in Mecklenburg, a hideout from the police inspired by the uncle’s posted reward. An injury to his ankle, and a German who had taken him in at his small estate. A kindly man, Herr von Marlow, and his lovely French wife. And there had been a daughter, a slender, dark-eyed girl, his one bright memory of those unhappy days. Fate had played them a scurvy trick. By a hideous mistake, the parents of Karol von Marlow had been shot as spies by the French. Fired by desire for vengeance, she had offered herself as an agent. The flame of revenge had died, he knew, but not until she had become the famous Fraulein Doktor, noted alike for her daring and her skill as a teacher of spies. That same mocking Fate had made him an enemy, cursed by the Boche as the “Brain-Devil of G-2,” with a price of twenty-five thousand gold marks upon his head. Somehow the “Brain-Devil of G-2″ and Fraulein Doktor manage to help one another avoid death or capture and still fulfill their respective missions while keeping just this side of treason. In one of the stories, Strange is Court Martialed for his perceived assistance of the enemy! They both still hold their love for one another in their hearts, even though this may be in conflict with their loyalty to their countries. If you have been following our dispatches then you already know that we lost our good friend Sid Bradd recently. Sid’s passing has left a void here at Age of Aces that just can’t be filled. And with Pulpfest 2012 happening so soon after his death, we were looking for a proper way to honor his memory. Sid was blessed with an incredible loving family, and we decided that the best thing we could do would be to express our feelings in person to his wife Johanne. We called her, and as luck (or fate) would have it, she extended an invitation for us to visit her on Sunday during our return from Pulpfest. Most years, the last day of Pulpfest is kind of depressing, knowing that it will be another year before you can get together again with your fellow pulpsters. But this year, for Chris, David, and I, Sunday would be the highlight of our trip. We made it to the Bradd’s home by late afternoon. Johanne met us at the door, along with her and Sid’s daughter Andrea. We presented them with a copy of our latest book. It was the last one Sid assisted us on, and we dedicated it to him. They were very proud of Sid’s abilities and talents as an aviation expert and historian, and we wanted them to know how much we appreciated his contributions to our work here. It was very moving to see their reactions when reading our dedication. It was clear how much it meant to them to know that Sid would be remembered by all of us here in the pulp community. Johanne also told us how Sid crossed paths with some of the legends of both aviation and aviation pulps. He had met people such as Henry Steeger, Robert Hogan, Donald Keyhoe, and Charles Lindbergh. Johanne related a story about Lindbergh and Keyhoe that provided the most surreal moment of the day. 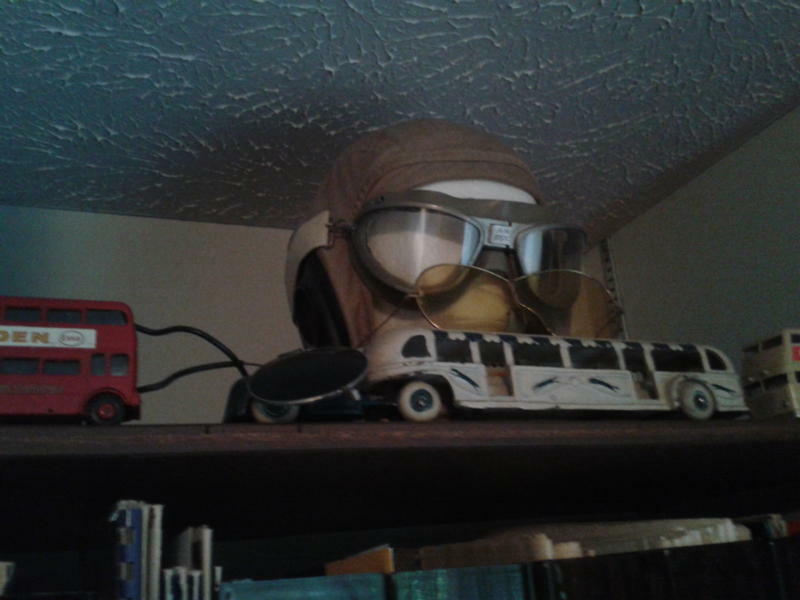 Before he became an author, Keyhoe was a military pilot. He was appointed to fly Lindbergh on his tour around the country after his famous solo flight across the Atlantic. Keyhoe published a book about his adventures on this tour called Flying With Lindbergh. Over the years Sid had used his friendly charm to strike up conversations with many people. On one occasion—many years after the Lindbergh tour—while Keyhoe was giving a speech, he sat behind Lindbergh in the audience. Afterwards he got Keyhoe to inscribe his copy of Flying With Lindbergh. His library contained many such books signed by some of the most notable names in aviation like Lindbergh and Earhart. One of the things Andrea wanted to convey to us was how meticulous Sid was with his collection and how much care he took when reading one of his books. She reached onto a shelf, grabbed a random book, and opened it. We were all stunned to see the title of the book she had pulled down. It was Flying With Lindbergh, and the page she had opened it to was the one that Keyhoe had signed. Andrea said that Sid must have guided her hand to that book. I totally agree with her! Johanne related another touching story to us. Because Sid’s life revolved so much around aviation, he had a deep interest in all of it’s legends and mysteries. So while speaking about their father at his funeral, one of Sid’s daughters remarked that he would now finally know what had happened to Amelia Earhart, Lindbergh’s baby, and Flight 19. Since you don’t visit the Bradds without having some of Johanne’s great German food, she went down to prepare a little something for us while Andrea finished showing us around the library. It seems Sid had a real passion for collecting in general, not just books. 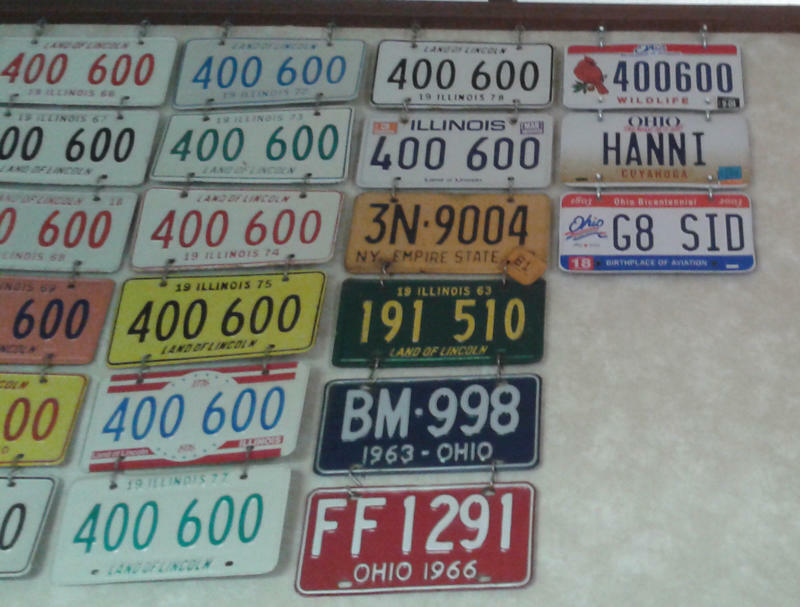 We saw his collections of old toys, old license plates, and old bottles. Sid was an accomplished painter and there were also many of his aviation paintings hanging in various places around the library. Andrea was also kind enough to show us the unfinished painting Sid was doing for her when he died. It was of the living room of his childhood home as he remembered it. But he was dissatisfied with how he had painted his mother sitting at the piano so he had partially erased her image leaving a ghost-like form behind. After eating dinner we unfortunately had to get back on the road. And while it was sad saying goodbye to Johanne and Andrea, we felt really good about having spent that time with them. Hopefully we can make that visit a regular stop on our Pulpfest excursion. Finally, many people have asked us if we knew what would happen to Sid’s library. Happily we learned that it will be finding a good home. While the plans aren’t finalized, they are hoping for it to be the centerpiece of a brand new aviation library and research center at the Pacific Aviation Museum on Ford Island in Hawaii. Just in time for PulpFest . . .
We’ll be debuting the second volume of our Captain Philip Strange series at PulpFest on Friday. So if you’re in attendance stop by our table and meet the Age of Aces crew and pick up a copy of Captain Philip Strange: Strange Enemies (and The Three Mosquitoes: The Thunderbolt Ace if you haven’t yet). He hope to see you there! 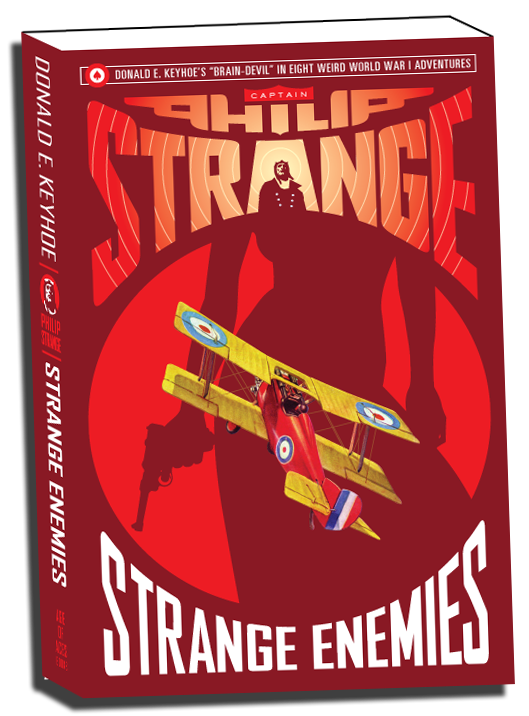 To get you excited about the new Captain Philip Strange book set to come out soon, we have a story from the fertile mind of Donald E. Keyhoe. This story has everything: An amazing new invention—smashing battles and cold-blooded murder high above New York skyscrapers—take-offs from catapults atop huge city buildings—parachutes coming to earth along the Great White Way. The first story of its kind and you’re sure to enjoy it! We’ve posted several stories by Donald E. Keyhoe on the site and collected his Vanished Legion stories from Dare-Devil Aces into a volume as well as our new series of his Captain Philip Strange stories that ran for nine years in Flying Aces. The first of which appeared just a year after this story in August 1931.